You need other means and methods to put out liquid fires than fires in solid materials. 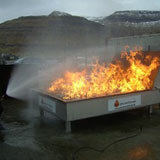 With TRAINERS 2m x 3m large liquid burner you can train putting out large liquid fires without any risk or pollution. The propane / butane gas bubbles up through the water and ignites on the surface giving you the exact same experience as would an authentic liquid fire. Furthermore, the specially developed ignition system ensures that the burner works smoothly regardless of the amount of water or powder on the burner.